This is the full interview with Ken Block relating to the Gymkhana lawsuit. Questions were emailed to Block who responded through an intermediary. Jalopnik: 1. When did you become aware that Gymkhana.com had been registered/ was being used, why not do something then? Ken Block: [I] first became aware that Mad Media had registered Gymkhana.com when a friend sent me a screengrab taken of a comment that Josh [Martelli] had posted on his Google+ account roughly around the time that we released our Gymkhana FOUR video. Josh's comment on the website consisted of two things: bashing Ford and then bragging that they were going to make their own video in the style of our Gymkhana brand videos but with offroad trucks, since they owned the URL. With regard to Josh's comment, we were really busy at the time and since I wasn't actually sure what Josh's plans were for the URL, I wrote it off as Josh just being bitter that he and Mad Media weren't involved with the Gymkhana FOUR project. With regard to the domain name, my experience has been that partners on projects who have been brought on in a work for hire situation like Mad Media was on these projects will sometimes acquire URL's to help protect the people they are working for and then assign them to the brand owner. So, particularly in light of them being a media company, I kind of assumed that might be the case here, and that Mad Media had purchased Gymkhana.com on behalf of its clients (us) and would pass along the URL with a comment like; "Just helping you out because we appreciate you as a client." Apparently, that was not the case! It turns out that they actually operate in a very unethical way when it comes to things like this. 2. What made you decide to sue now? A colleague of mine that works at a car manufacturer hit me up, asking if I had anything to do with the website, as this colleague had been approached by Mad Media to purchase advertising on the site. He had no clue that neither myself, nor DC Shoes, were affiliated with Gymkhana.com, and that gave us major cause for alarm. After we and DC Shoes had worked so hard to build the Gymkhana brand, we were really upset to learn that Mad Media is wrongfully using the value in our brand and the mark Gymkhana to drive traffic to what's nothing more than a very general motorsport blog so Mad Media can profit off our goodwill. It's a classic bait and switch technique since the content on the site is not in any way catered to anything associated with me, DC Shoes, or the Gymkhana brand or our video series. Instead it covers everything from road rallies to off road truck racing. We're now suing because of this, because it's hurting the Gymkhana brand by diluting the power of the mark to identify the source of genuine Gymkhana events and videos and because it's creating confusion about what the brand actually is and whether I am associated with or a sponsor of the site. At the end of the day, I love the brand and loyal following we have been able to build around our Gymkhana events and video series, and I want nothing more than to see it grow here in America. I've been working on making our events something that regular drivers could enjoy and have access to-just like traditional autocross. What Mad Media's doing right now isn't helping that cause, it's only hurting it. 3. Have you ever asked to buy/acquire Gymkhana.com? Before filing the lawsuit, our lawyers asked Mad Media to transfer control of the URL to us after we realized that Mad Media was trying to dilute the meaning of our brand and trying and profit off of the brand we built by confusing the public about the source of the goods and information on Gymkhana.com. In contrast, the website Gymkhanagrid.com, which we control, provides information about an actual race series that's running right now [Gymkhana GRID has five events happening in Europe this year]. What also upsets me about this, is that if Mad Media had approached me like a reputable media company with a well thought out and developed business plan for Gymkhana.com that made actual sense for helping to grow the Gymkhana brand, I would have been open to working with them on it. Instead though, they went completely behind my back and blindsided me. That's just not what I was expecting from a company that I'd worked with for five years. Plus, over those years, I continually recommended them to my sponsors and helped them secure plenty of work. 4. Could this not have been settled out of court? You know, after working together for five years, we'd all become pretty friendly. I've actually known Matt Martelli since I was in college [over 20 years ago]. Unfortunately, when I reached out to Josh Martelli about the site and the URL, he essentially told me to go f myself, which came as a huge shock to me! We'd worked together for a long time, become friendly and neither myself, DC Shoes or anyone on my team felt as if there was any bad blood with Mad Media up to that point. In fact, I was still using them and giving them work up until March of this year! I thought they were a trustworthy and ethical company, but apparently I was wrong. 5. Martelli had nothing at all to do with the production other than filming it? What was his role then? Mad Media and the Martelli brothers were hired to produce the videos [direct the production staff, film and edit the videos], that's it. The creative concept, creative direction and the direction of the edits were handled entirely by myself, DC Shoes and members of my rally team. It would be a major misconception about the Gymkhana Practice, Gymkhana TWO and Gymkhana THREE videos to suggest that Mad Media was hired for these as a creative agency to DC. In reality, they were only hired to handle production. Everything from the concept to the editing to even many of the camera angles, were controlled by myself and the DC Shoes creative team. 6. What's your goal with this lawsuit? My end goal for this lawsuit is to rightfully retrieve a URL that should belong to myself and DC Shoes so that I can stop Mad Media from continuing to mislead the public and dilute the Gymkhana brand. At this time, we can't comment on the lawsuit, other than to say it is completely without merit and we intend to defend it vigorously. However, anyone who is familiar with our work can plainly see that it could hardly be described as a "recording." As the credited directors, producers and editors of three highly successful Gymkhana-titled films, we are proud of our work, for which we have received several industry awards. The automotive sport gymkhana has been around since the early 1900s. No one has the right to prevent the public from using the word gymkhana to report on, discuss, or promote the sport - especially on a website. Surely our friends at Jalopnik understand the importance of free speech. 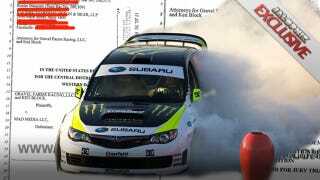 Jalopnik reported on a similar instance of Ken and Wassermann Media Group suing another prominent member of the gymkhana industry here in the US not more than a year ago. To threaten everyone wishing to participate and report on the sport of gymkhana, with high-priced attorneys and lawsuits - seems to be a slap in the face to the folks who support gymkhana videos in the first place. We invite your readers to come by www.gymkhana.com and check out or coverage of precision driving and motorsports.